I am often asked about social media’s role in education, Twitter in particular. These questions are often brought about by parent concerns, which often mirror the initial concerns of teachers. I have written many things in the past about social media in schools but there are always new questions that aren’t addressed by old posts. There is a time stamp if you follow it. One can piece together a class schedule. Why are teachers stopping instruction to take photos? Yes, a tweet is time stamped. 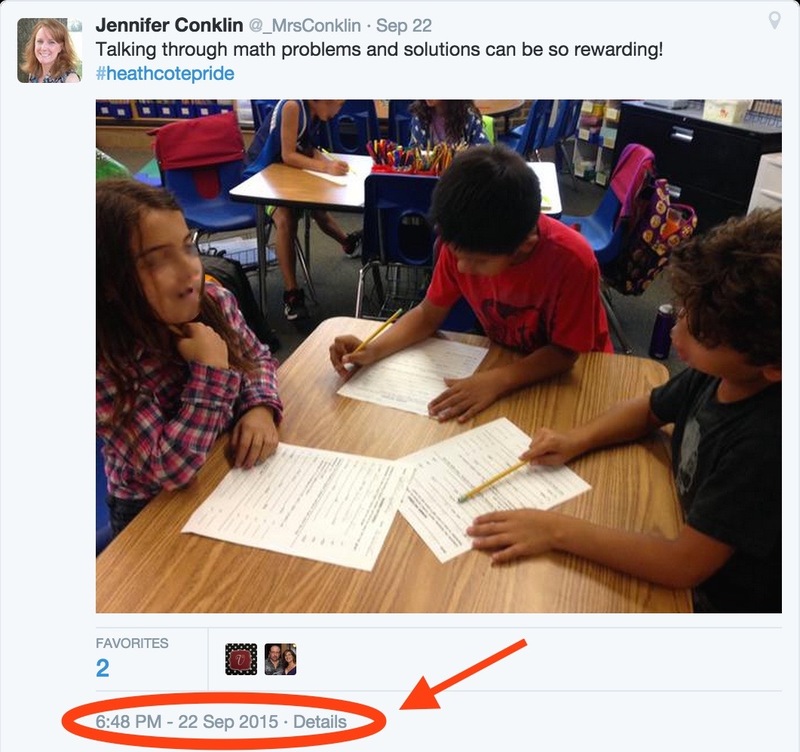 However, it is a timestamp of when it was posted, not necessarily when the photo it contains was taken. A lot of teachers will take photos throughout a lesson, or even an entire day, and then post them all at once during a prep period, a lunch period, or after school. Twitter has the ability to be real time but it doesn’t have to be real time. To draw a parallel, think about email. Most email services have ways to schedule messages. As a GMail user I can use an add-on called Boomerang which will let me schedule a message to be sent. If I want something sent at 6:00 am on Monday, I can schedule it. The recipient receives it at 6:00 am but I didn’t physically write it and hit send at 6:00 am. Even without scheduled emails, we often begin an email draft at one point in the day but don’t send it until another time. Same concept applies here. Just because you get it at a certain time doesn’t mean it was created seconds before. The timestamp says 2:49 pm. Ms. Franchini’s class was not in the lab at 2:49 that day. They were in that day, just much earlier. Ms. Franchini took that photo during the lesson but didn’t actually tweet it until much later in the day. Essentially, just because a tweet is timestamped doesn’t mean the activity you see happened seconds before it was tweeted. And even if it was, there is no guarantee that activity will occur at that same time tomorrow, or the same day next week. The timestamp is just the time it was tweeted. With so many variables happening within any given school day, gleaning a regular schedule simply from timestamps would be impossible. 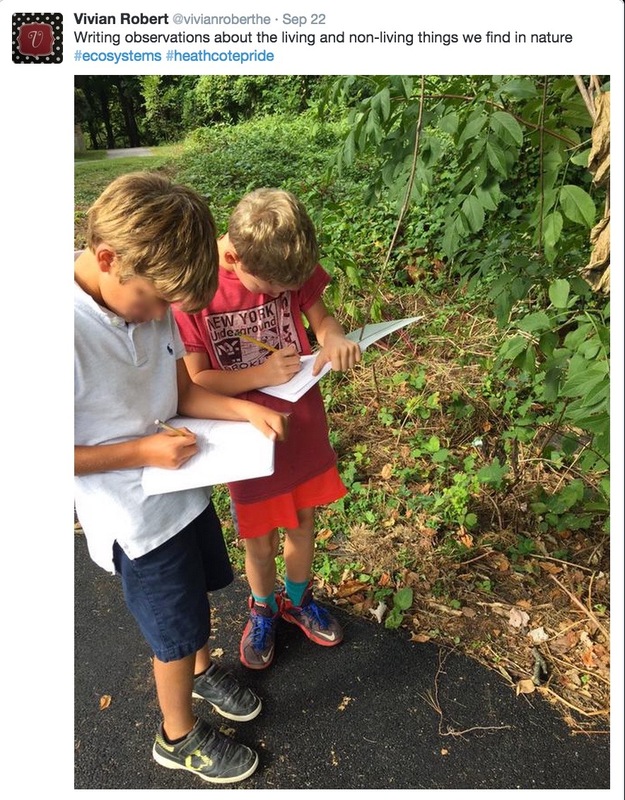 Using the example above, Ms. Franchini did not stop instruction to take the photo. I was providing the instruction, she took a few seconds to document the moment. It in no way impacted the lesson and the students were not even aware she was taking it. She then tweeted it hours later. In all three of those tweets the photos were of independent student activity. In fact, the teacher was doing what good teachers do: Observing, documenting, and engaging with students during independent activities. The last tweet, by Ms. Robert, is an awesome example! 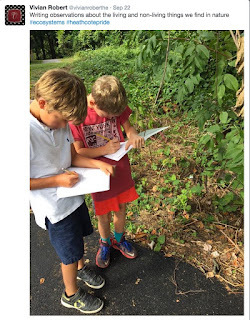 She is observing and documenting her students, who are observing and documenting. She is modeling for her students a part of the lesson they just had. 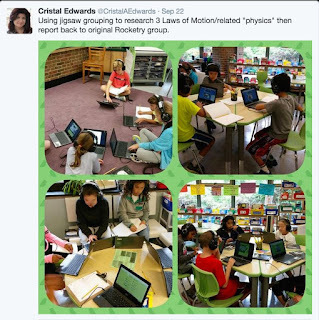 We don’t know specifically what the lesson was about -- she did not stop the lesson to tweet -- but we see that the independent activity for students was to observe and document. Ms. Robert was an active participant in the lesson, alongside her students, by independently observing and documenting. She is leading by example. Teachers don’t stop lessons to tweet. They tweet when they have time. To build off the first question of the time stamp, they most likely aren’t tweeting “in real time” but rather much later. As for the pictures, they are being professional observers of student practice and reflective practitioners of their craft by documenting activities for future reference. The tweet is to celebrate the students and the classroom and give parents an opportunity to see first-hand all the awesome we experience every day. Teachers should be lifelong learners, active participants in their students’ experiences, collaborative with parents and peers, and open to sharing the great things their students are doing. Teachers who tweet are doing all those things. 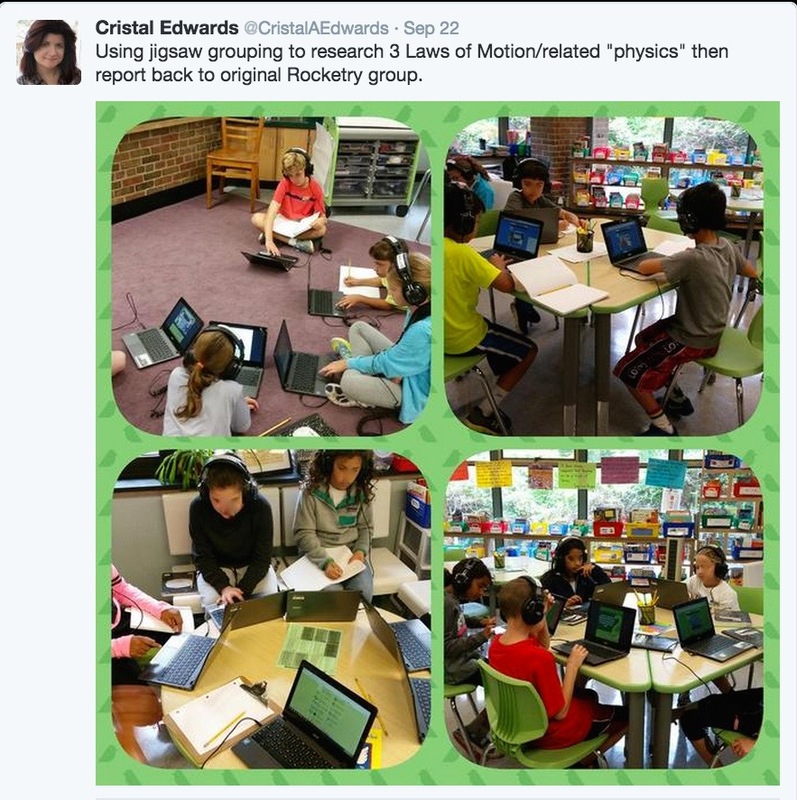 It’s not that teachers who don’t tweet aren’t doing these things, but in 2015, where the concept of “social media” is coming upon its 10th birthday, using tools such as Twitter is just as important for teaching our students as is using a pencil and paper. Our role as teachers is to help our students learn and grow, and to prepare them for the future. I feel there is no better way to prepare them for the future than to show them positive, productive uses for modern tools.